Love the necklace + dress combo! You can’t go wrong with J.Crew. Every piece is so pretty and that dress is no exception. I love the eyelet and that fun necklace you paired it with as well! Thanks Megan. I’ve been wearing JCrew since i was a kid. They’ve never let me down. This dress is stunning! Such a perfect and versatile piece for summer and it fits you perfectly! Thank you Heidi. Reason for the perfect fit? I altered it a tiny bit in the waistline. It was a little loose and taking it in, in the back helped. You can always count on jcrew! 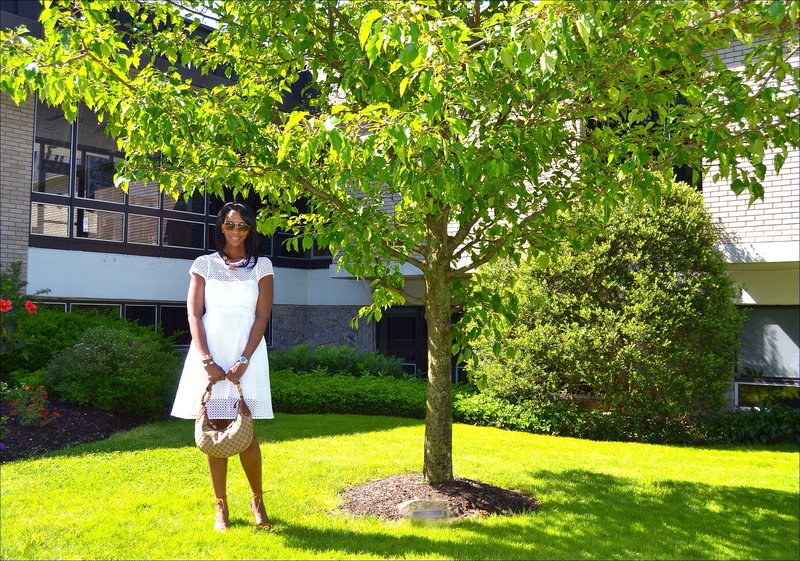 You look beautiful in white! I totally agree. Thank you so much Amy. Gorgeous, gorgeous! 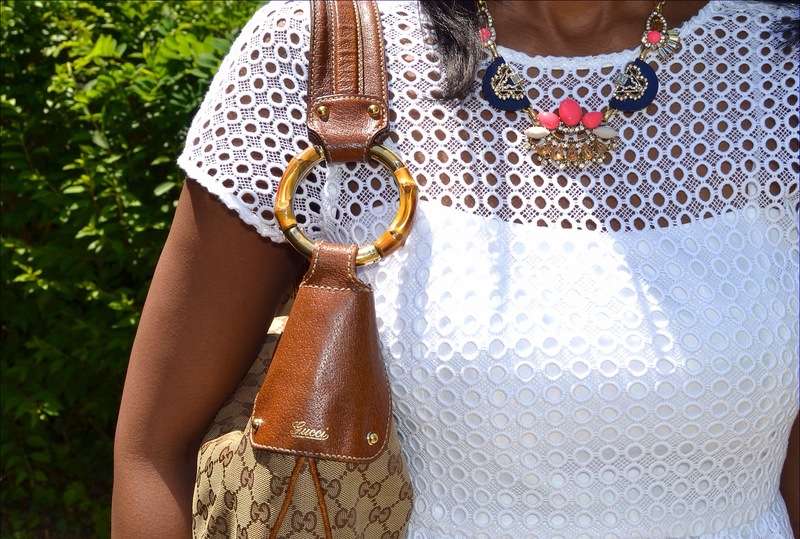 White eyelet is so pretty for summer- and love the necklace you paired with it! So true. The summer heat will hitting NYC soon enough and eyelet will be my new BFF. It fits you so well! 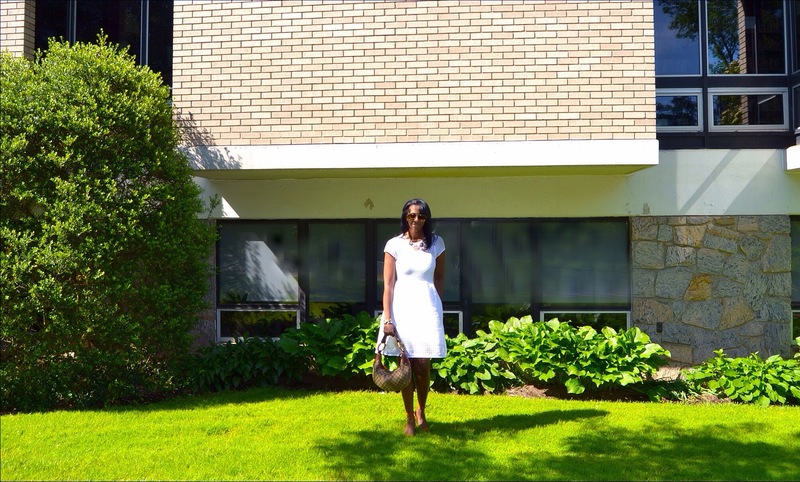 The eyelet makes it a great little white dress! Such a lovely white dress! Thank you Busola. Truth be told, I nipped it in at the waist by hand. Not much, just a tiny bit but it made a big difference visually. 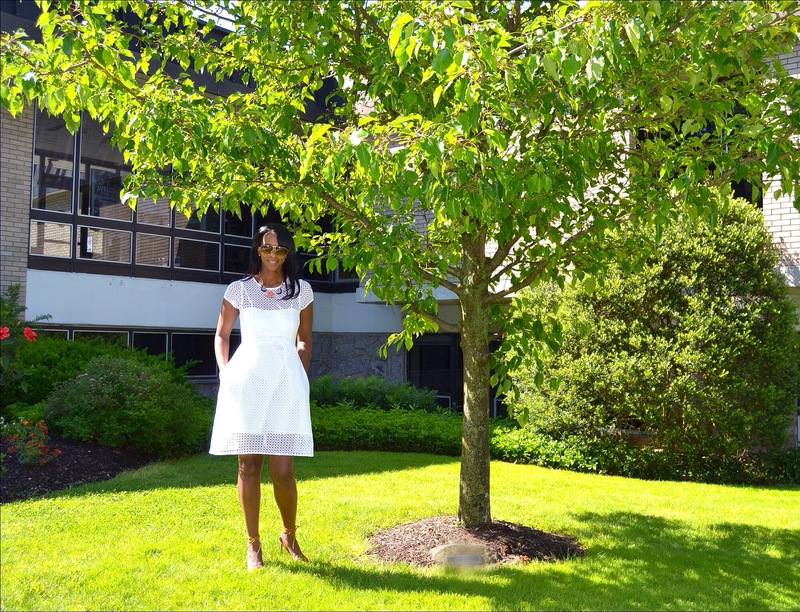 Such a pretty eyelet dots dress, the shade of white is so perfect for Summer too! You look great! Thanks Prudence. Crisp white is the best isn’t it. I actually changed the dress the other night. I added a contrasting color of eyelet to the hem. Hopefully I’ll have pictures to show soon. Such a cute dress! 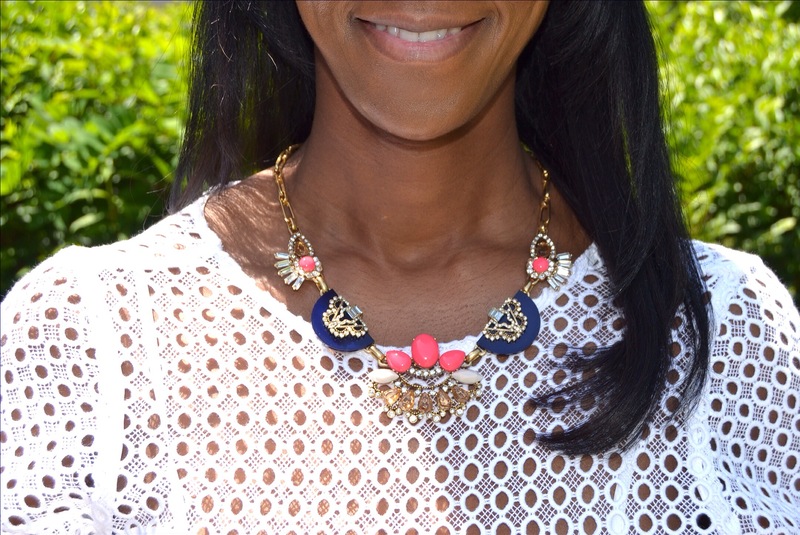 You look great and love your statement necklace! I really like the dress. Its so pretty. The dress looks gorgeous on you! I know what you mean after going on a shopping spree, even after buying a designer it’s always the small gem that you get that captures your heart. Thanks Sophie. I appreciate the really sweet compliment. However, after look at my frame in this dress, I realized the scale/balance is off. It was designed for someone much shorter than I. I’m 5’10 and this would be suited for someone around 5’5 or shorter. I decided to do my own alterations. I added an additional 4.5 inches to the length by sewing on a contrasting blood orange eyelet boarder. Hopefully I’ll be able to post pictures soon. You’re right Sophie. I don’t know about you but I seem to get more compliments on lower priced pieces. So odd. And thanks for dropping by. I really love your details!!! Wow, thanks Jon. Yup, it’s only JCrew. Such the perfect little dress. I’ve since made some changes to the dress. I hope to post the redesign soon. Stay tuned. I’m obsessing over this pretty dress! Your fun necklace really pops against the eyelet!! Thanks Courtney. Happy to hear you appreciate the little extra touches. A necklace can really complete a look… in my opinion.